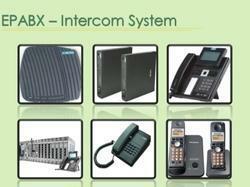 Intercom System for free calling in company or home. With a firm commitment to quality, our organization is engaged in trading a wide ambit of EPABX System for our respected clients. Power Consumption: 40 Watts Max. Todays EPABX System is a technological marvel, one needs an EPABX system, which can integrate telephone, fax, VOIP, computer connectivity, WLL, Fixed Cellurar Terminals etc in one board seamlessly. Some of the features include Voice Mail, Auto attendant, music on hold, conference bridge etc. We offer these solutions to our client. We are looking queries from Gujrat.